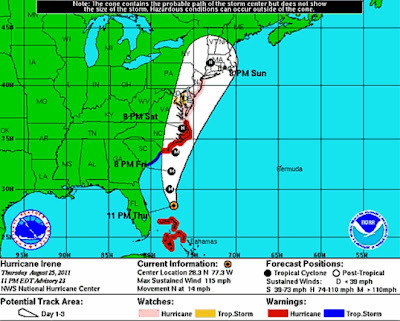 As of this writing, Hurricane Irene is tracking to go up the east coast and cause havoc up and down the eastern seaboard. Having just come from a brief visit to hurricane country, it distresses me that a storm of this magnitude could hit an entire region that isn't used to hurricanes. I pray this storm veers off into the Atlantic and causes minimal damage. But meanwhile, dear readers, please be safe!! Which area are you talking about that isn't used to hurricanes? Hurricane Alice from the 1970s is still (when you adjust for inflation) one of the most damaging hurricanes on record. It got way up into upstate New York. Generally when the hurricanes get much past North Carolina they slow up because of all the moisture they have sucked up. Then they dump enormous amounts of rain in fairly hilly areas that channel this water in such a way as to cause some pretty impressive floods. This is how Katrina (by then a wet versus fast storm) did so much damage in the mountains of North Carolina. When you see the big problems (Huricane Floyd for instance) in low lying areas is when it has already been raining heavily prior to the Huricane so the rivers and lakes are already at high level. North Carolina has been getting some pretty big rain storms recently. North Carolina (because it sticks so far out into the Atlantic) is the second or third most commonly hit state: which means that the mid-atlantic states catch at least some of that water. russell1200, You must not be a farmer. NC has been in the midst of a severe Piedmont and extreme Coastal drought since July. We are no way even near our normal rain fall averages this year. Livestock herds are being sold off due to the lack of green hays on pasture. Coupled with the rising costs of providing supplemental feeding required this year, the farmer and herdsman is going financially negative this year due to the short tonnage yields from the soybean, corn and buckwheat crops this year, all due to the lack of rain. Constant Irrigation is expensive to operate. Hay bales are being 18 wheeler trucked in long distances from upper Northern States sold at much inflated prices. We welcome and need the rain. We do not welcome the high winds that strips the fields of it's pre-harvest grains. Atlantic, far away from His remnant people in NC. Sigh...there goes our garden. We've gotten 6" of rain in the past 2 weeks, and now a projected 5" to 15" in the next few days. Tomatoes are already exploding on the vine. If the wind doesn't rip it out, it will surely drown. to all in the path, get your water, flashlights, generators, etc set up now! 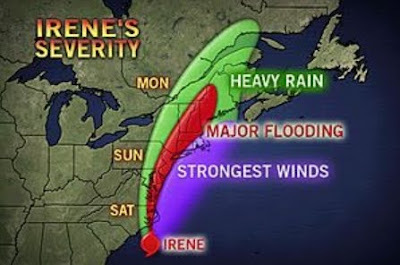 One newscast last night stated Irene could directly impact as many as 55 million Americans. If that worst-case scenario plays out, the result could be the final straw for our economy. In which case, Irene would directly impact 310 million people. I pray she takes a sharp right turn and heads out to sea, never to be heard from again. I live in Maryland. We can count on getting hit with the remnants of a Hurricane about once a year or so. I went to the grocery store this morning at 8 to pick up more canning lids and the store was already wiped out of water and toilet paper. The bread aisle was being restocked while I was there, as was the milk. I was out and about again at noon, and the lines at the store were phenomenal. Cars parked over a mile away and people were hoofing it in to the grocery store. The parking lot was gridlocked. We live far enough away from the shore that our biggest concern is a power outage. I pray for the folks on the Eastern Shore of Maryland. Lots of Low-Lying areas and high tide is scheduled to hit at the same time as the worst of the storm; Sat. at 5 p.m. The losses are going to be phenomenal. looks like most who live in the region for this hurricane are pretty smart...hopefully none will pull a new orleans number requiring the coast guard to pull them out cause they were stupid enough not to evacuate the area. no excuses are good enough to not evacuate!!! I live in Southeastern Virginia, and we'll be getting hit tomorrow sometime between 2:00p and 6:00p as near as we can tell. As the previous posters mentioned, the stores are being stripped right now, and gasoline is getting more difficult to find. At lunch today I was out and about to: (1) pick up a few not really needed items, because I wanted to (2) get a sense of the level of desperation of the non-prepper population. The local BJ's Wholesale store had very little in the way of bread, batteries, bottled water, and whatnot left on the shelves. Also, their filling station ran out of regular gasoline and the manager said the trucks couldn't get down to our area because of the heavy evacuation traffic. All in all, though, everyone seemed to be keeping a level head. But really, this week has been one for the record books. Tuesday we get an earthquake. Saturday we get a hurricane. I'm guessing that on Sunday, while we're still out of power, the locusts and frogs will hit.